VanBandhu Kalyan Yojna by Tribal Development Department, Govt of Gujarat is aimed at uplifting the social and economic condition of people of Tribal Area of Gujarat. GSFC Agrotech is the implementing agency of this scheme. 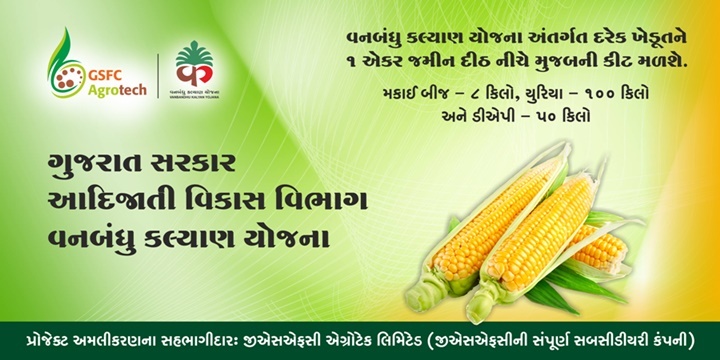 Under the scheme tribal farmers will be provided high quality seed along with fertilizers mainly Urea, DAP & MOP. Identified beneficiaries will also be given training about crop management for increasing productivity. 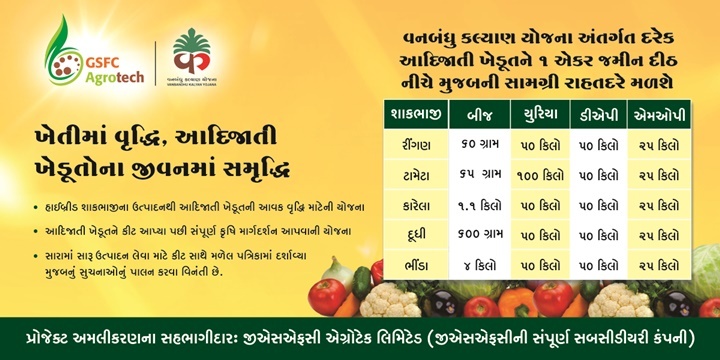 Quality Seed of Maize, Brinjal, Tomato, Bitter Gourd, Bottle Gourd & Okra will be provided along with fertilizers; 119603 farmers have been identified in 14 tribal districts of Gujarat for this scheme.